WASHINGTON — The U.S. Census Bureau on Wednesday released a 2010 Census brief, “The Asian Population: 2010,” which shows the Asian population grew faster than any other race group over the last decade. Out of the total U.S. population, 14.7 million people, or 4.8 percent, were Asian alone. In addition, 2.6 million people, or another 0.9 percent, reported Asian in combination with one or more other races. Together, these two groups totaled 17.3 million people. Thus, 5.6 percent of all people in the U.S. identified as Asian, either alone or in combination with one or more other races. The Asian alone-or-in-combination population grew by at least 30 percent in all states except for Hawaii (11 percent increase). The top five states that experienced the most growth were Nevada (116 percent), Arizona (95 percent), North Carolina (85 percent), North Dakota (85 percent) and Georgia (83 percent). These same five states also experienced the most growth in the Asian alone population. The states with the highest proportions of the Asian alone-or-in-combination population were in the West and the Northeast. The Asian alone-or-in-combination population represented 57 percent of the total population in Hawaii. California had the next highest proportion at 15 percent, followed by New Jersey (9 percent), Nevada (9 percent), Washington (9 percent) and New York (8 percent). These same six states had the highest proportions of the Asian alone population. The 2010 Census showed that New York City had the largest Asian alone-or-in-combination population with 1.1 million, followed by Los Angeles (484,000) and San Jose (327,000). Three other places — San Francisco, San Diego and Urban Honolulu — had Asian alone-or-in-combination populations of more than 200,000 people. This ranking was identical for the Asian alone population. The places with a total population of 100,000 or more with the greatest proportion of the Asian alone-or-in-combination population were Urban Honolulu (68 percent) and nine California cities — Daly City (58 percent), Fremont (55 percent), Sunnyvale (44 percent), Irvine (43 percent), Santa Clara (41 percent), Garden Grove (39 percent), Torrance (38 percent), San Francisco (36 percent) and San Jose (35 percent). Of the 17.3 million people who reported Asian, 2.6 million, or 15 percent, reported multiple races. Of the multiple-race Asian population, the majority (1.6 million or 61 percent) identified themselves as both Asian and white. The next largest combinations were Asian and “some other race” (9 percent), Asian and black (7 percent), Asian and Native Hawaiian and Other Pacific Islander (6 percent), and Asian and white and Native Hawaiian and Other Pacific Islander (5 percent). 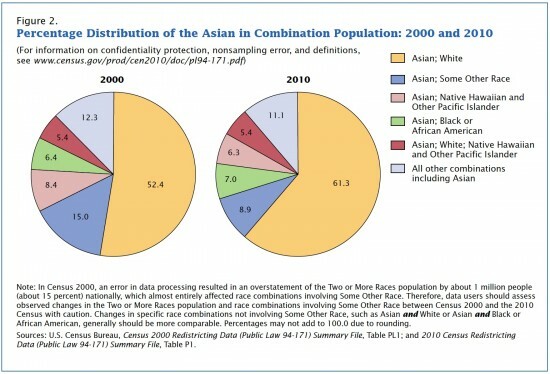 The 2010 Census also provided information on detailed Asian groups. For example, the Chinese, Filipino, Asian Indian, Vietnamese, Korean and Japanese populations each had 1 million or more people. Chinese (4.0 million) was the largest detailed Asian group, with 3.3 million people reporting Chinese alone and an additional 700,000 people identifying as both Chinese and one or more additional detailed Asian groups and/or another race. Filipinos (3.4 million), followed by Asian Indians (3.2 million), had the next largest number of people who reported one or more detailed Asian groups and/or another race. Among the Asian-alone population that only reported one detailed Asian group, the order of the second- and third-largest groups switched — the Asian Indian (2.8 million) group was the second-largest, followed by Filipino (2.6 million). The Chinese-alone population remained the largest. Among the detailed Asian groups with populations of 1 million or more, the Japanese population had the highest proportion that reported multiple detailed Asian groups and/or another race (41 percent). The Filipino population had the next highest proportion, in which 25 percent of Filipinos reported multiple detailed Asian groups and/or another race. The geographic distribution of the detailed Asian groups focuses on the population that reported one or more detailed Asian groups and/or another race. Among detailed Asian groups with a population of 1 million or more, Japanese (71 percent) and Filipinos (66 percent) had the largest proportions living in the West. Large proportions of Chinese (49 percent), Vietnamese (49 percent) and Koreans (44 percent) lived in the West as well. A much lower proportion of Asian Indians (25 percent) lived in the West. Among all detailed Asian groups, the Asian Indian population was the largest in 23 states, of which 13 were in the South, six in the Midwest and four in the Northeast. For every state in the West, either the Filipino population or the Chinese population was the largest detailed Asian group. The Filipino population was the largest detailed Asian group in 11 states, the Chinese population was the largest in nine states and the District of Columbia, the Vietnamese population was the largest in five states, and the Hmong population was the largest in two states. Among the 20 metropolitan statistical areas with the largest Asian alone-or-in-combination populations, Chinese was the largest detailed Asian group in six of the 20 metro areas (New York, Los Angeles, San Francisco, San Jose, Boston and Seattle). The Asian Indian population was also the largest detailed Asian group in six of the 20 metro areas (Chicago, Washington, Dallas-Fort Worth, Philadelphia, Atlanta and Detroit). Filipinos were the largest in five of the 20 metro areas (San Diego, Riverside, Las Vegas, Sacramento and Phoenix), followed by Japanese, Hmong and Vietnamese in one metro area each (Honolulu, Minneapolis-St. Paul and Houston, respectively). People who reported only one race on their 2010 Census questionnaire are referred to as the race “alone” population. For example, respondents who marked only an Asian category or categories would be included in the Asian alone population. This population can be viewed as the minimum number of people reporting Asian. Individuals who chose more than one of the six race category options on the 2010 Census form are referred to as the race “in combination” population, or as the group who reported more than one race. One way to define the Asian population is to combine those respondents who reported Asian alone with those who reported Asian in combination with one or more other races. Another way to think of the Asian alone-or-in-combination population is as the total number of people who reported Asian, whether or not they reported any other races. For a copy of the report, go online to: www.census.gov/prod/cen2010/briefs/c2010br-11.pdf.